Good vanilla is one of my favorite flavors, and the idea of "plain vanilla," vanilla as the no-flavor flavor, has always been somehow annoying. And it wasn't always the case. Vanilla is native to the Americas and although probably in use for millennia there, it only reached Europe after 1492. At that time it was a rare and highly desirable flavor. Vanilla comes from “beans,” long thin bean-like pods, but vanilla is not at all a bean (legume, plant family Fabaceae), but an orchid (plant family Orchidaceae). In fact, it is the only orchid used as a food, or used by commerce in any other way than as ornamentals (flowers) even though there are more species of orchids than species in any other plant family, legumes and grasses included. 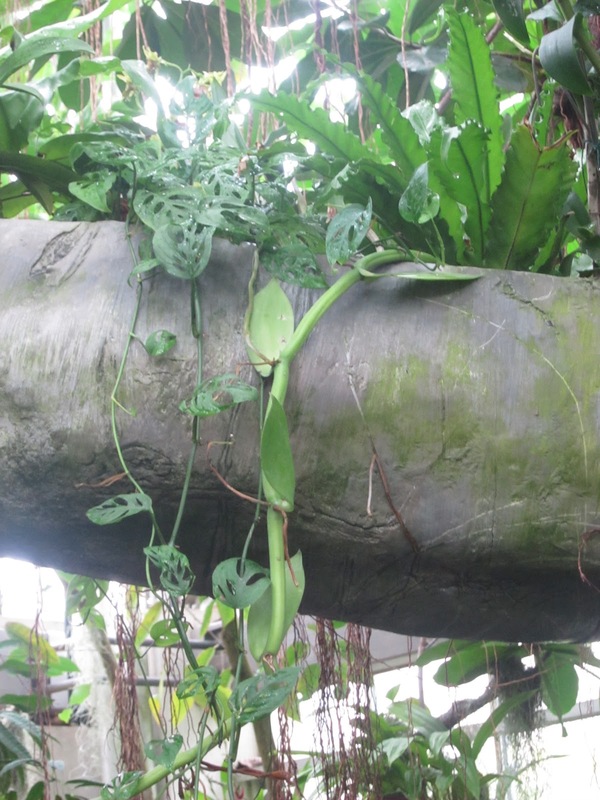 Vanilla is a climbing vine with fleshy leaves longer than my hand, but 2-3 fingers wide. We grew a vanilla orchid in the greenhouse at the University of Nebraska. It climbed up to the ceiling. Then its stem connecting it to the pot broke, so the plant was hanging from the wall and ceiling without being rooted in soil at all. It lived like that for years. And that was fine until we wanted to move it...which is of course one function of flowerpots, mobility. The flowers of the vanilla orchid are cream-colored recognizable orchid flowers ( vanilla flowers on Google). The fruit develops as long dark pods. As is typical with orchids, the seeds inside the pods are tiny. But the pod around the seeds grows several inches long. This is what forms the spice, vanilla. The fruit takes about nine months to mature. The pod with mature seeds smells and tastes nothing like vanilla until it has fermented. In vanilla production today, pods are dried in the sun for up to four hours then tightly wrapped in airtight boxes to sweat. This may be repeated daily for up to a month. Then they are dried indoors for a month and conditioned for another 3 months. I presume the people who discovered vanilla picked up fermenting pods on the forest floor. Current taxonomy recognizes 103 species of vanilla, genus Vanilla. The major species in cultivation is Vanilla planifera, which is native to the Mexico. Vanilla was an important ingredient in the chocolate eaten by the Aztecs. Cortez and his men, or settlers in Cuba sent vanilla beans (as well as cocoa beans, chili peppers and cochineal dye) home to Spain, probably by 1510. The very first vanilla to arrive was described as a perfume but it was soon used as a flavoring. The Codex Barberini, called the Badianus Manuscript, an Aztec herbal from 1552, written by Martius de la Cruz, in Latin, clearly describes it. Franciscan Friar Bernardino de Sahaguin, who went to Mexico in 1529, popularized the use of vanilla in his Florentine Codex: General history of the things of New Spain, published in Spain in 1560. The Aztecs called it tlilxochitl. Our name for vanilla is from vainilla, “little pod,” based on the Spanish word vaina, “pod.” By the second half of the 16th century, the Spanish had the Indians in Mexico harvesting, fermenting and drying vanilla for export to Europe to be used with chocolate. The Spanish name was disseminated to Europe along with the product. It was a rare and extremely expensive spice. The earliest use of vanilla alone is credited to Hugh Morgan, an English pharmacist at the court of Elizabeth I. In 1602 Morgan reportedly tried vanilla alone in candies. The Queen liked it and thereafter consumed a lot of vanilla. Wilson reports that vanilla became popular in England later than that, late in the 17th century, presumably as supplies increased. Vanilla was recognized as a desirable crop early in the 1500s and plants were successfully transplanted to tropical countries all over the world. However, no vanilla was produced. In its native forests, vanilla is pollinated by very specific insects. As late as 1971 the pollinator of orchids had not been identified. We now know they are stingless Melipona bees (pictures of Melipona bees from Google. I've worked a little with Melapona in Costa Rica, they're cute). Without these bees carrying pollen between flowers, vanilla will not produce seeds or pods. Not only that, a particular species of bee is required for a particular species of vanilla orchid. At the time that vanilla was transplanted around the world, science did not understand plant reproduction and could not explain why vanilla production failed. It was not until the 1760s that botanists began to figure out how insect pollination of flowers worked. Hand pollination of vanilla in Madagascar successfully produced pods there. Even today, hand pollination is used to ensure adequate pollination of vanilla flowers. Hand pollination is slow work, part of the reason for the continued high price of natural vanilla. Natural vanilla, made from fermented pods, includes tiny black vanilla seeds and so can be easily distinguished from products made with vanilla extract or artificial vanilla. Vanilla availability gradually improved as vanilla plantations around the world, especially Madagascar and Oceania, produced vanilla. Extracting the flavor into alcohol, in vanilla extract (1847), allowed even easier use of vanilla flavor in cooking. In 1874 German chemists synthesized vanillin, the most important compound in vanilla. Vanillin can be made from a variety of natural materials, including wood pulp. This dramatically reduced the cost of vanilla flavor, creating our world in which "plain vanilla" denotes the bland, "default" flavor. It isn't necessary to settle for plain vanilla, however. Natural vanilla is still available, still expensive, and a much more complex and interesting flavor than synthetic vanilla. Emmart, E. W. translator & editor. 1940. The Badianus Manuscript. (An Aztec herbal of 1552). Johns Hopkins Press. Baltimore. Faegri, K. and L. van der Pijl. 1971. The principles of pollination ecology. 2nd ed. Pergamon Press, Oxford. "Vanilla," The Plant List (2010). Version 1. Published on the Internet; http://www.theplantlist.org/ (accessed 2/15/13). Buy the Book! Give it as a gift! This story and thirteen other plants from around the world are told in Curious Stories of Familiar Plants from Around the World. Available on Amazon link. That is really good and very informative post. You have written it beautifully and easy to understand. Thanks for sharing it with us.. Vanilla Bean Kings is the best place to buy premium Madagascar gourmet vanilla beans. Where to buy Madagascar vanilla beans We offer a variety of differentgrades and liquid extracts to choose from for all industries. VanillaMg has selected for you the best quality Vanilla beans collected from small local organic producers in Madagascar.